Chả lụa (Saigon: [ca᷉ lûˀə]) or giò lụa (Hanoi: [zɔ̂ lûˀə] is the most common type of sausage in Vietnamese cuisine, made of pork and traditionally wrapped in banana leaves. Chả lụa has been incorporated into Thai cuisine under the name mu yo, and is widely eaten all over Thailand. Here it is shown with a som tam style dressing. Traditionally, chả lụa is made of lean pork, potato starch, garlic, ground black pepper, and fish sauce. The pork has to be pounded until it becomes pasty; it cannot be chopped or ground, as the meat would still be fibrous, dry, and crumbly. Near the end of the pounding period, a few spoonfuls of fish paste are added to the meat for flavor, but salt, black pepper, and sugar can also be added. The meat is now called giò sống, meaning “raw sausage”, and can be used in other dishes, as well. The mixture is then wrapped tightly in banana leaves into a cylindrical shape and boiled. If the banana leaf is not wrapped tightly and water leaks inside while it is being boiled, the sausage will spoil quickly if kept at room temperature. The sausage has to be submerged vertically into boiling water, and a 1-kg sausage typically takes an hour to cook. Correctly made chả lụa can be stored at room temperature for about one week, but it is recommended to keep it refrigerated until used, where it can be stored for up to 3 - 4 weeks. During the initial wave of Vietnamese immigrants to the United States in the mid-1970s, banana leaves were difficult to find; thus, Vietnamese chefs substituted aluminum foil for banana leaves, a habit that continues today. In areas that have banana leaves, a small strip of it is used for flavor while still using the aluminum foil to shape the sausage. 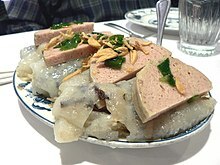 The sausage is normally sliced and eaten with bánh cuốn, bánh mì, or xôi, or braised in fish sauce and black pepper with other meat dishes. If fried, it is called chả chiên. Wikimedia Commons has media related to Giò lụa. ^ "Chả lụa / Giò lụa".